Mail Motor Service Hyderabad Recruitment 2019: Mail Motor Service, Hyderabad is conducting recruitment processes to fill 2 vacancies. As of now, there is one recruitment drive going on for MV Electrician & Painter Posts. 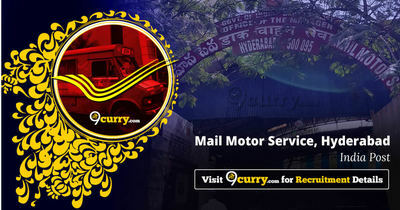 Mail Motor Service Hyderabad Recruitment 2019 - Job notification for Staff Car Driver Posts in Mail Motor Service Hyderabad, Hyderabad, Telangana on Direct Recruitment. Applications are invited by Mail Motor Service, Hyderabad on or before 30 Mar 2019 for 3 vacancies. Mail Motor Service Hyderabad Recruitment 2018 - Job notification for Staff Car Driver Posts in Department of Posts, Mail Motor Service Hyderabad, Telangana. Applications are invited by Mail Motor Service, Hyderabad on or before 24 Nov 2018 til 05:30 PM for 2 vacancies. Mail Motor Service Hyderabad Recruitment 2018 - Job notification for 10 Staff Car Driver Posts in Mail Motor Service Hyderabad, Hyderabad, Telangana. Applications are invited by Mail Motor Service Hyderabad on or before 25 Jun 2018 til 05:30 PM for 10 vacancies.